Popperola has been quiet for a while. This was due to the fact that I was moving house but now I’m fully settled in my new home, it’s again time for some writing. So here are a few reviews of notable records (and more will follow very soon). 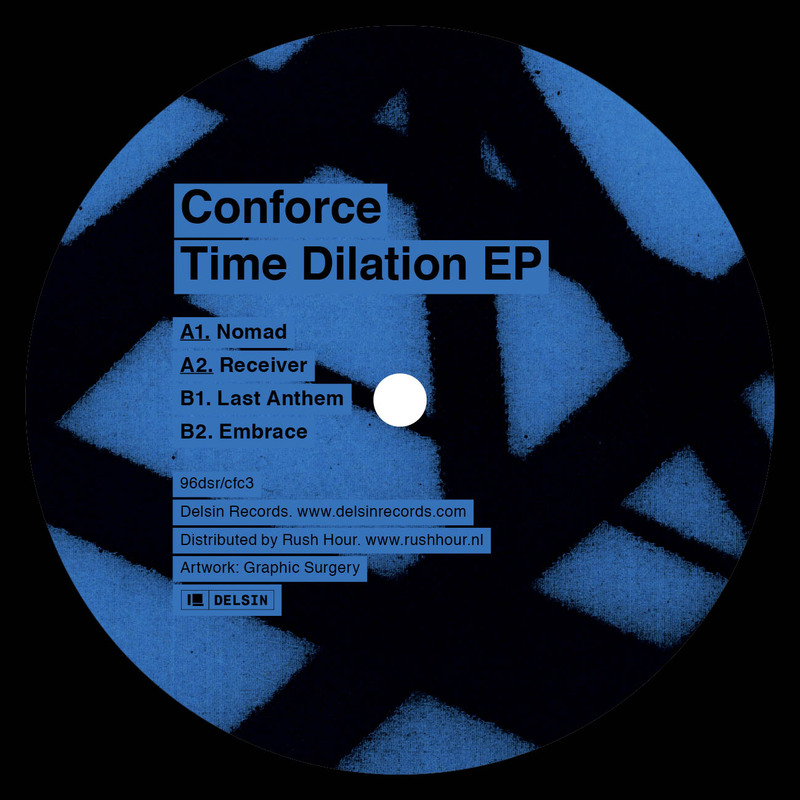 Firstly I’d like to m ention a new ep by Dutch producer Conforce, a man glowing with great talent. On his recently released “Time Dilation EP” on Delsin Records you’ll find four high-quality techno tracks that represent four different takes on the genre. Opener “Embrace” is a beautifully worked, otherworldly piece, coming along as a quasi-archetypical example of deep dub techno. “Last Anthem” then consists of warm, subaquatic tones contrasted with high shrieking sounds and a few underlying melodic synth lines on a simple, even substratum of beat and hi-hats: a configuration aimed at a trance-induced dance. Melody has been cut from “Receiver”, a darker and more metalloid fabrication. Lastly, In “Nomad”, the consistent beat pattern has been replaced by a more complex percussive structure which forms the basis for a track that seems to convey an introvert yearning. Striking and moving, to say the least. 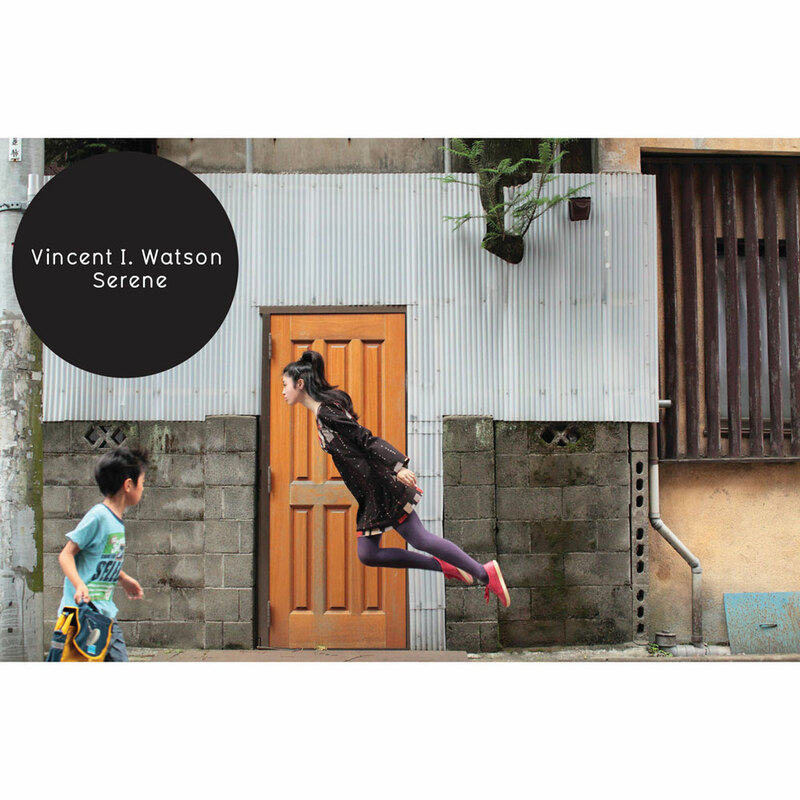 Now, I must admit that I’ve always been quite a fan of Vince Watson’s work which, as you might kno w, is a personal variant of classic Detroit techno with an accumulation of lush, harmonic lines and endowed with great melodies. The man recently was given the opportunity by Pyramids Of Mars to draw attention to a different aspect of his oeuvre. P.O.M. is a fresh enterprise of Matt Edwards (Radio Slave) and thus a little sister of his Rekids that seeks to combine an output of left field music with design and art. Since Watson’s music was used in “Mad Dogs”, a British television series on Sky1, the Scottish-born producer has set out to explore the combination of cinematic art and music further under his full name Vincent I. Watson. The result is the album “Serene”, a collection of ambient tracks that indeed would go well with moving images. Seemingly, it is made with a similar modus operandi as Watson’s techno material: gradually well-chosen layers of sound are woven into a mesh of almost sublime splendour. The thrusting beats and percussion have evidently been left out but the usage of hardware that is typical for Detroit techno and early electronic popular music is still a basic premise. Also, the man’s talent as a piano player often comes to the fore more noticeably. Moreover, what connects this material perfectly to film and television is that it evokes a narrative structure including elaborated build-ups and fragments of tension release. In short, this is an album that’ll let you blissfully float in the vast territories of your fantasy. 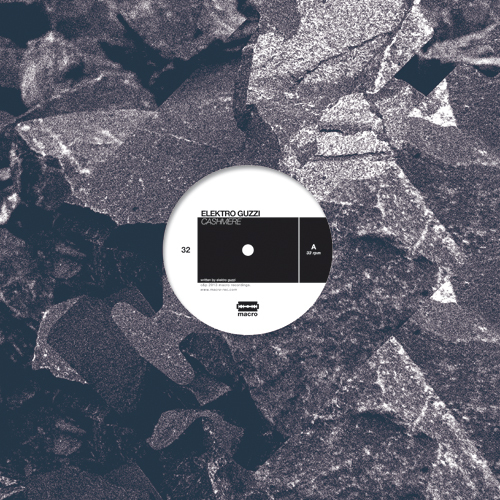 At the present time the label Mote Evolver continues to deliver high standard, proper techno. A new release is due in a few days and is in fact a collaborative work of two producers on their peak, namely Silent Servant and Lucy. 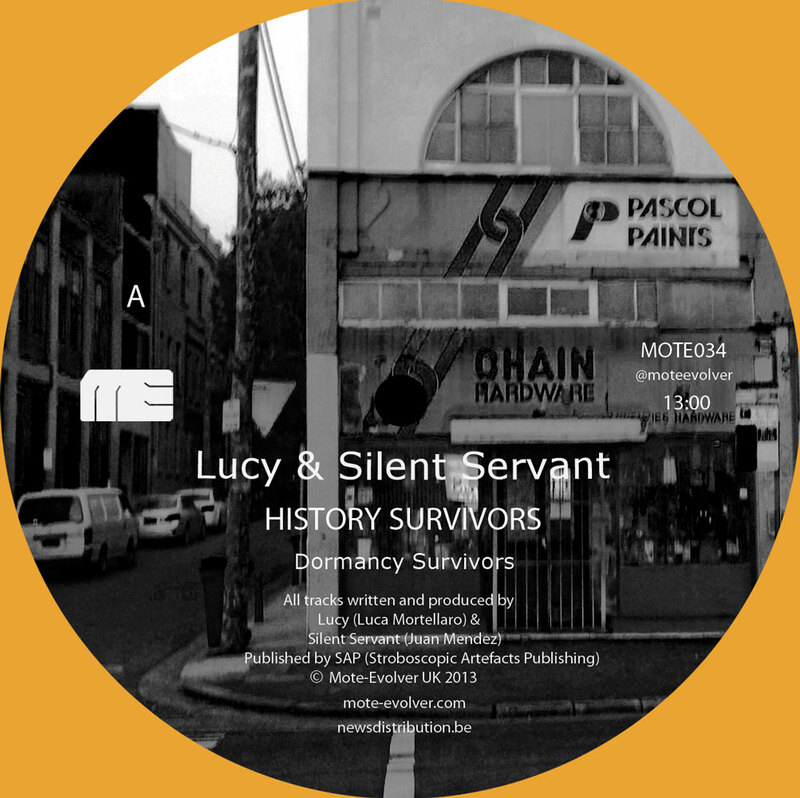 Their ep “History Survivors” contains two tracks of relatively long duration that reveal the distinctive treatment of noise and weird, industrial sounds of the first as well as the latter’s capacity to develop arresting arrangements. So in its length of thirteen minutes, “Dormancy Survivors” does not fail to keep attention focused, its storyline remaining haunting and edgy. “Victors History” on the b-side has a distinct percussive quality and is more hypnotic by nature. While bleeps and shrieks reverberate, some stretched synthesizer notes bring emotion into play. Anyway, it’s a superb record that I’d like to recommend. Something of another kind is the work of the Austrian band Elektro Guzzi. They can be considered as the main protagonists of what is called live techno, by which is meant techno performed with real instruments, other than live sets done with hard- and software by producers. Elektro Guzzi’s merit is that they play exceptionally tight, so that the warmth and organic sound of their analogue instruments fall together with their mechanical precision. Often this brings to mind other styles that heralded techno, such as krautrock. Their latest ep, which will again be released by Macro and is produced by their compatriot and techno veteran Patrick Pulsinger, features three pieces or, to be precise two tracks and a reverse version of one of these. “Cashmere” itself is, well, live or not, a thriving piece with a certain drama that is as captivating as it is hot. The reverse version (on the B-side of the vinyl version) is just what it claims to be: the same structure but re-written and played backwards, which the band delivers as an equally great song. “Crack Fox” has a stirring quality, mostly because of the wobbling, repetitive guiding sounds that are topped up by short, drone-like horn touches and a guitar part that sounds similar to a new wave lick. Indeed, Elektro Guzzi once more made a record with a lively and warm sound and well-balanced in recording and production that proves their status. To conclude I’d like to point out a remarkable release by Dinos Chapman, one of the Chapman brothers, a British visual art duo that, since the early 1990s, drew a lot of attention because of the shock value in their oeuvre. Mind you, this is hardly ever without purpose and they keep succeeding in asking relevant questions. 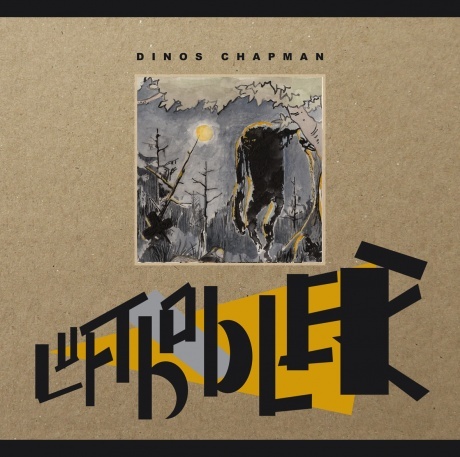 To work independently from one another is very unusual but now Dinos Chapman has conceived a music album called “Luftbobler” (on The Vinyl Factory) full of weird and extraordinary electronic music. In several instances, this works quite well. I’d suggest you check it out yourself; you can find some tracks here, and you might as well read this interesting interview with the Londoner in The Guardian, where he discusses the idea behind the making of this album, his musical influences and the work he does with his brother Jake: www.guardian.co.uk/artanddesign/2013/feb/19/dinos-chapman-first-album-luftbobler.